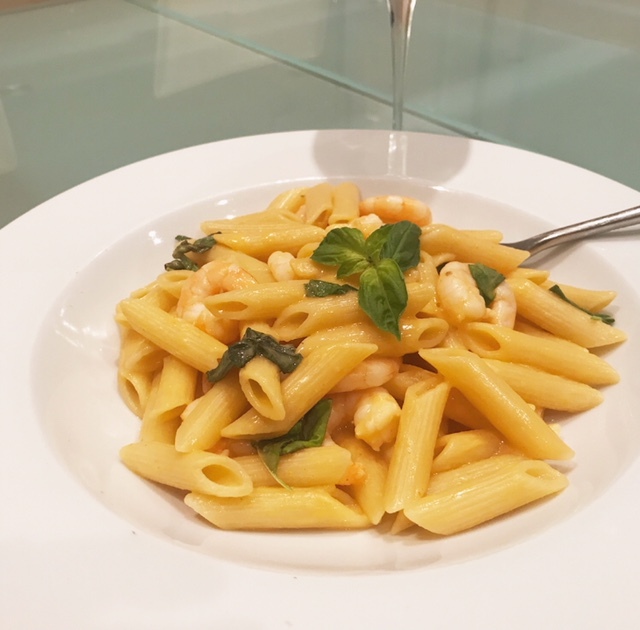 Wonderful light & delicious penne with prawns, wine, tomato & crème fraiche – a fantastic combination! 1. Cook the penne as per packet instructions. 2. In a large frying pan heat the olive oil and add the onions, garlic, celery and carrot and cook until soft. 3. Add the flour and stir into the softened vegetables. Add the tomato puree, lemon juice, wine and reduce. Add the fish stock, bring to the boil and reduce then pass the liquid through a sieve and return to the pan. 4. Bring the sauce back to the boil and add the prawns reduce the heat to a simmer until the prawns are cooked. Now add the crème fraiche, penne and then stir in the parmesan and some basil leaves torn. 5. Serve with a sprinkle of parmesan and basil, enjoy!